To provide area-wide basic education, INES conceptualizes a school system which is mobile and activity-oriented. This is in stark contrast to formal schools in fixed settlements with teacher-centered methods. INES is based on the field-tested MultiGradeMultiLevel-Methodolgy (MGML) which was successfully developed and implemented in Southern India. The MGML-Methodology offers students and teachers a reliable framework for both individualized and community oriented education in remote areas. Core elements of the MGML-Methodology are Ladders of Learning which guide the children through the syllabus through joyful and meaningful learning activities. The MGML‐Methodology allows mixed‐age groups to work together within the designated learning area of the nomadic settlement yet at varying achievement levels (‘multi‐grade, multi‐level’). Its primary objective is to help children experience their personal learning progress and develop their personality while staying familiar with their nomadic culture lifestyle. 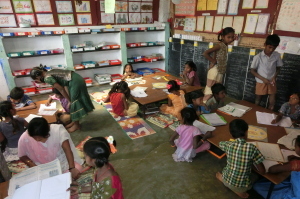 The children may seek support during their learning activities from specially trained but non-professional Daasanach community teachers. 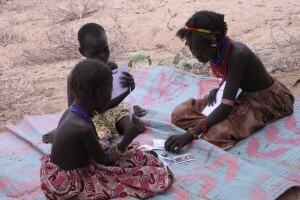 Contrary to the classical fixed schools, the INES-teachers are also pastoralists, with basic education and understanding of the MGML-Methodology and its corresponding learning materials. With this knowledge at hand they are able to guide and support the children whenever necessary.